function, EL back light. Nice kid watch suitable for both boys and girls as Christmas gift. Please tear off the protective film on the screen before use. Please DO NOT PULL OUT the Button Underwater. ★Multi-functional Kid Watch: Please tear off the protective film on the screen before use. Digits LCD Display, Display Hour, Minute, Second, Week, Stopwatch, Shock Resistant, Hourly Chime and Daily Alarm, 12H/24H format is changeable, Chronograph with split function, EL back light. Nice kid watch suitable for both boys and girls. 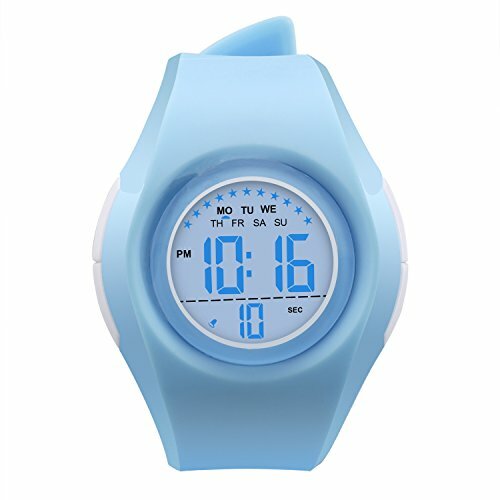 ★Kindly reminder:waterproof children wrist watch,only 50 Meter Water resistant, can prevent rain and wash hands.Can not to wear our digital watch for swimming and diving. Can not be used in hot water, can't wear it in hot bath or sauna.Please DO NOT press any buttons underwater.Too much water contact or usage in extreme Hot or Cold temperature will shorter watch life. Guarantee: our children's watches are guaranteed. If there are any problems, please contact us, and will give you satisfactory service. If you have any questions about this product by PERSUPER, contact us by completing and submitting the form below. If you are looking for a specif part number, please include it with your message.